MANTUA, N.J. -- Primary Sponsor Sponsor Hangsterfer's Laboratories, manufacturers of premium metalworking lubricants, announced their continued support of brothers Matt and Zach Sackman in the NHRA Lucas Oil Drag Racing Series. Hangsterfer's is entering their third season as the primary sponsor on the Sackman Boyz Racing Top Dragster and will also support Matt as he runs two races in Top Alcohol Dragster. "We're proud and honored to go into our third year of primary sponsorship with the Sackman Boyz Racing team," said Bill Jones, vice president, Hangsterfer's Laboratories. "We're a family-owned business and we enjoy the opportunity to support a family-based team. We're also proud to roll out a full new wrap on the Top Dragster, as well as custom Hangsterfer's-branded firesuits and helmets for the boys." Established by Dr. William Hangsterfer in 1937, Hangsterfer's Laboratories specializes in the research, development, custom formulation, and manufacture of a full line of REACH-compliant metalworking lubricants. The company is in its third generation of leadership. "I feel that we share a lot of common goals with the Sackman family, including striving to be the best we can be in our respective industries," said Ann Jones, president and CEO, Hangsterfer's Laboratories. "We're proud to support Matt and Zach and to plant the seeds to nurture drag racing's next generation." Matt Sackman, 25, looks to build on a strong 2018 season that saw him reach the final round at the NHRA Sportsnationals and the Drag Illustrated World Series of Pro Mod. He also made his Top Alcohol Dragster debut at his home race, the NHRA Division 3 race at Route 66 Raceway in Joliet, Ill. He drove one of Randy Meyer Racing's A/Fuel cars to the No. 1 spot in qualifying and claimed the event win. He's scheduled to run two more races in Top Alcohol Dragster this season, beginning at the season-opening NHRA Winternationals next week. "We definitely couldn't race as much as we do without the support of Hangsterfer's," said Matt Sackman, who is also a cylinder head specialist on Antron Brown's Matco Tools Top Fuel dragster. "We're trying to represent them well and connect them to new customers to make it worth their while to be out here supporting drag racing. We're glad to be a part of the Hangsterfer's family, and they truly treat us like family. It really means a lot to have their support." Zach Sackman, 23, will be the primary driver of the Hangsterfer's Top Dragster. After earning his first NHRA national event Wally in 2017, Zach wheeled the family-owned blown Top Dragster to victories at the Norwalk and Indy Division 3 races in 2018. With late-round finishes at other divisional races and national events, Zach finished sixth in NHRA Top Dragster national points and second in the Division 3 championship chase. "It's exciting to have Hangsterfer's back for a third year," said Zach, a fabricator at Brandospeed in Fairfax, Iowa. "It's rewarding to know that they see value in partnering with us and giving us the opportunity to represent them. I'm eager to take what I've learned over the last few seasons and put it toward delivering more strong finishes for everyone at Hangsterfer's." 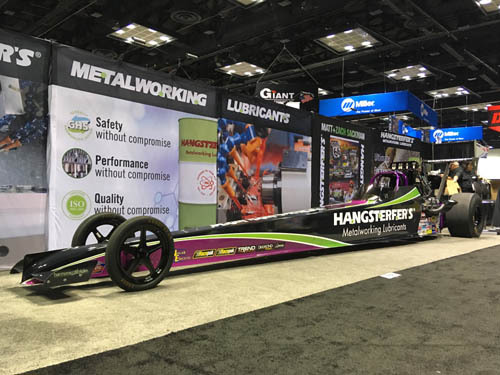 Hangsterfer's Metalworking Lubricants will also continue their commitment as a major associate sponsor on Antron Brown's Matco Tools Top Fuel dragster and Tommy Johnson Jr.'s Make-A-Wish Funny Car under the Don Schumacher Racing umbrella. The company also supports the Midwest Jr. Super Series as a class sponsor. As a sponsor of drag racing at various levels, Hangsterfer's finds it rewarding to work with the Sackman brothers. The Illinois natives rose up from the Jr. Dragster ranks to their current status as proven competitors in the NHRA sportsman world, with goals of racing Top Fuel in the future. "Matt and Zach have made the most of the opportunities they've had, from Zach winning the Route 66 Nationals to Matt winning at Route 66 in his Top Alcohol Dragster debut last year," said Mike Ditzel, performance racing products specialist, Hangsterfer's Laboratories. "They've met the goals we've set together and they continuously rise to the occasion. I don't expect it to stop here." Matt and Zach Sackman will begin their 2019 season at the 59th annual Lucas Oil NHRA Winternationals presented by ProtectTheHarvest.com, Feb. 7-10, at Auto Club Raceway at Pomona in Pomona, Calif.